November 26, 2018 - Why Did Stocks Drop? 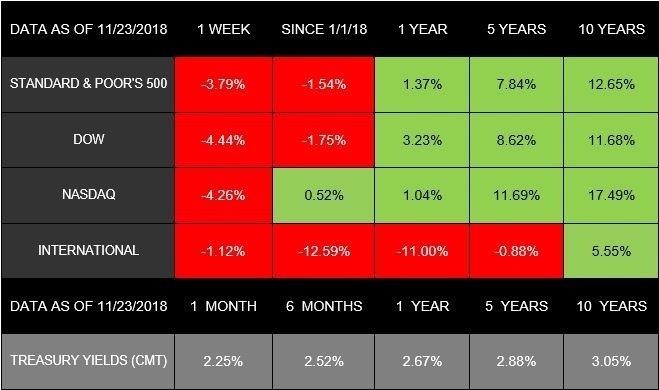 Last week was a tough one for markets. The S&P 500 dropped 3.79% and experienced its worst results during a Thanksgiving week since 1939. While the index officially entered correction territory on Friday, it closed 10.2% below its most recent record high. Meanwhile, the Dow and NASDAQ continued the downward trend, losing 4.44%, and 4.26%, respectively. International stocks in the MSCI EAFE also declined, posting a 1.12% loss. Reading these results may feel quite unpleasant and elicit concerns about what is ahead. As is often the case, the story behind the numbers can help us understand the complexity and what this performance means. Plummeting oil prices were one of the biggest drivers behind the market's losses, as investors worried that too much oil is available. These concerns have contributed to oil experiencing seven weeks of losses in a row and dropping more than 20% so far this month. While oil was a key focus last week, many other details were also on investors' minds. Major tech companies continued to struggle and posted sizable losses for the week. In addition, the markets still don't know how the Brexit deal, political challenges in Europe, and ongoing trade tension will all work out. Examined together, these challenges can create questions about the strength of global growth. Will the market losses continue? Trading was light last week: The days before and after Thanksgiving had trading volume that was much lighter than normal, which often happens during this time period. This lower volume can exacerbate pricing trends, such as the declines we saw with oil. As a result, Friday's performance may be less significant than it seems on the surface. Black Friday shopping was strong: Brick-and-mortar stores had people lined up for discounted buys, and online purchases were 28.6% higher than in 2017. The holiday season is very important for retailers, and these initial results indicate consumer spending may remain strong through year's end. In the coming weeks, we will gain a clearer understanding of many market influences. President Trump and Chinese President Xi are scheduled to meet this week at the G20 summit to discuss trade. Right now, the markets may be assuming these talks won't solve the trade tension and that an economic slowdown could be ahead. Investors may also doubt whether oil-producing countries can slow production fast enough to counter reduced demand. Other experts believe we are experiencing a disconnect between what investors are feeling and what is truly happening in the economy. As a result, a so-called "Santa Claus" rally could occur as consumer spending continues during the holiday season. But these perspectives are opinions, not a crystal ball. No one can say for sure how these complex scenarios will play out. Rather than rely on guesswork or headlines, we'll continue to look for clear trends and insight that support your long-term goals. If you have questions or want to talk about your current investments and strategy, we are here for you.